Security and defence is the area in which the EU has advanced most in recent years. A principal element of this process is the proliferating number of military and civilian crisis management missions in Europe, the Middle East, Africa and Asia. Clearly, Europe has come a long way since the disappointments and frustration in the 1990s, when, in light of the violent disintegration of Yugoslavia, analysts argued that the EU foreign and security policy was ‘neither common, nor foreign, nor dealing with security, nor (could) be called a policy.’ Since then the newly developed European Security and Defence Policy (ESDP) has become the necessary framework for the formulation and implementation of effective European security policy. 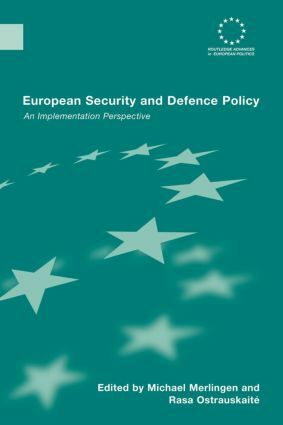 The European Security and Defence Policy will be of interest to students and scholars of international relations, security, European studies, foreign policy, peacekeeping and transatlantic relations. ESDP Operations and NATO: Co-operation, Rivalry or Muddling-through?